The key to selling an item on the auction house is understanding how to value the item. To value the item you have to be able to pick out the things that players want. Here is a great presentation that goes into the topic of item valuation among a lot of other things. Markco, who formerly made a fantastic WOW gold guide, has been talking about Diablo 3 with Sixen. Initially this seemed like a bad Legendary item which would never sell. But that opinion may have been created by the failure of my first item up for auction on the RMAH. 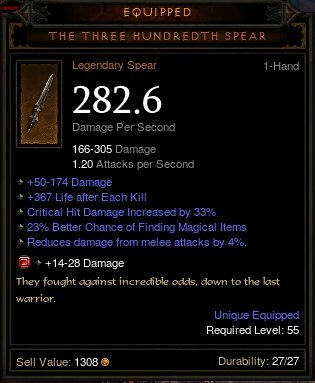 After listening to Markco and taking a second look The Three Hundredth Spear has a really nice stat and may be worth selling after all. Let’s take a look at the item, and discuss how to use it to best effectiveness. The DPS is not the highest. It is 91% of the highest possible DPS the weapon can spawn with (with the added Gem). So this item is not a ‘perfect role’. The +Min Damage is higher than normal, but without the DPS being very high that doesn’t really help sell the item. The +life near the low end. 4% reduction of damage from melee attacks is the highest this item goes. The real ‘gem’ of this item is the Magic Find%. 23% is quite a lot for one item, but is it worth getting worked up about? The target market for this item would be the Farmer. The Magic Find really carries this item as something worth buying. Without it being stellar in any other way there really is only one market for it. No one is going to want to down bosses or power level characters with 282 DPS. Many fans of the move 300 have left comments on web about wanting the spear simply because of the movie reference. There is no reason that will translate into additional dollar valuation, however. This doesn’t amount to much, as it’s doubtful that 300 fan boys are going to want to shell out cash just because of a vague reference. So do I keep this item and use the +Magic find for farming? Or post the item in the RMAH to try and reach my goal of paying for the game? I think it’s worth a round of auctioning at $250, just to see if anything happens, and because it might be better if it doesn’t sell. But is the utility going to be worth more than $250 to me? It’s a tough call. Opportunity Cost and Net Present Value. Is $250 cash worth more to me this weekend then the potential of future increased magic find? What do you think?